The weather this week has been cool but dry, so we’ll have a better track than previous weeks. It should be close to a slow 6, and no more rain is forecast at this stage. The rail moves out 4m so it’s hopefully a much fairer racing surface too. Not a lot of speed here with most preferring to take a sit. Silent Sedition should have enough speed to cross those inside of it, and look for others to slide forward from wider: Rising Romance, Euro Angel, Jessy Belle and Oregan’s Day. 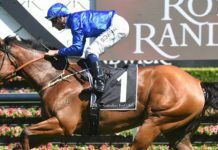 Silent Sedition (Noblet / Williams): entitled to be favourite. 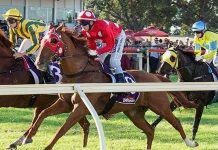 Has to contend with a big weight turnaround from the Coolmore, but she put in an enormous effort, sitting three and four-wide on a solid pace and only just getting pipped. Then went to Melbourne and won a Group 1 over 1200m again sitting wide. Back up to the mile here and gets a positive map. First Seal (Thompson / Shinn): showed little first-up in the Coolmore. She improved second-up in Melbourne, but would have to do so again here from a wide draw. Heavens Above (Martin / Angland): the Coolmore winner. Honest, gets back and sprints home well with a very good turn of foot. She lacks speed but could be a little closer here due to the draw. Real Love (Weir / Rawiller): the one that interests me of the Melbourne horses. Comes out of the right races and gets back to mares grade here. Gets a soft draw and should have a good run after settling in midfield. Definitely needs to be respected. Zanbagh (Thompson / Lane): did us a favour last start, but she got a lot of favours herself as had conditions to suit. Gets a poor draw here on a drier track and I’m happy to leave her out. Dixie Blossoms (Quinton / Clipperton): has had things against in three of her four runs this prep and gets a tricky draw again here. She’s best ridden with a sit but can show some speed. Does have the talent but just not sure where it will be in the run. Danish Twist (Lees / Bowman): similar profile to Silent Sedition. Was third in the Coolmore on the worst part of track, then back to 1200m last time where she hit line well. Slight query at 1600m, but the draw gives her a chance to use her turn-of-foot. Great odds. Rising Romance (Hayes & Dabernig / Berry): coming out of weaker Melbourne races this prep. Old form is good but again, the the draw is against. I’m happy to be against her, she’s not up to it this stage but perhaps the blinkers on can rekindle her form. Euro Angel (Hawkes / Brown): has talent on her day but has pulled badly in her last three starts and it’s hard to see that changing here. Elle Lou (Waller / Doyle): sprinting home in good figures in weaker races before failing over 1900m last time. Better suited back in distance and could settle closer from the draw. Seems big odds. Jessy Belle (Hayes & Dabernig / Zahra): didn’t do enough first-up in Melbourne and just needs to improve generally. Abbey Marie (Kent / Nolen): only run in Sydney was average. She could improve but I want to see something from her first. Extensible (Snowden / Clark): first-up run was solid behind Spectroscope, then second-up she was ridden a tad close in the wet and didn’t finish off. She could be an improver here if ridden quieter on a dry track. Pure Pride (Johnson / Collett): getting back and running on okay in Melbourne, but this is harder. Draw could suit. 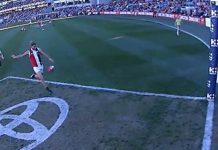 Diamond Made (Cross / Taylor): not good enough for this. 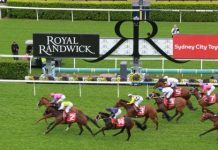 Foxplay (Waller / McEvoy): the high-profile 3YO filly in the race. She lacks speed but is running on okay. Map against and she will find it harder than previous races. Happy to be against at current odds. Oregon’s Day (Price / Oliver): another Melbourne runner. She improved last start but needs to do so again here. Silent Sedition is on top here. Danish Twist is good value, Elle Lou looks overs, and you have to respect Real Love, Dixie Blossums and Heavens Above. It’s for punters who want to win, but don’t have the time for the full ratings package of prices, speed map notes and the live Q&A page. 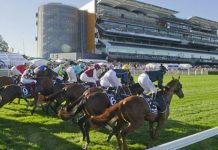 Focusing on all NSW metro meetings plus Wyong, Newcastle, Kembla Grange and Gosford, it has made $12,000 at 9% PoT since launching in January 2016. And the minimum bet rules in NSW means you are guaranteed to be able to get your bets on. A monthly membership is great value at $199, or you can get on board for the annual deal where you get 2 months free for paying upfront.